On the weekend, my experience at the boot fitting was still bothering me - it just didn’t seem like everything was right. I decided to research how much pain people experience when their angle was adjusted, and whether anyone felt any “tearing” sensation. I did find one reference to adherence of the tendon to the skin via scar tissue - but that was a report from much later in the process. Also, there didn’t seem to be many reports of significant pain when getting put into the boot. I started getting worried enough, that I decided to call the on-call doctor (Unfortunately it was President’s day weekend by now, and there was no way to contact my regular doctor). After hearing my description, the on-call resident predictably asked “So what’s changed since Wednesday?” and I had to say nothing, other than I started getting worried. He basically told me there wasn’t much he could do for me, and that the best path was to contact my doctor’s office next week to see if they could see me. He did confirm that what I described didn’t seem normal, and that he would be concerned. As an aside: One of the things that’s been the hardest for me to take about this experience is the long periods of uncertainty - I like knowing what’s going on, and can usually cope well if I have an idea what to expect. The uncertainty is just stressful to me, and it seems there’s been many periods where I had an idea that something was wrong, but no way to get confirmation (like after my initial misdiagnosis, for example). In any case, I settled in to wait - my doctor’s office scheduled an appointment for me a week after my previous appointment, on Wednesday. Of course, as the things go, the doctor was running an hour and a half late that day. After a long wait I was led into an exam room. The first person to see me was a resident (he didn’t introduce himself that way, but I figured he was likely to be one, and later confirmed this via some cyber-stalking). I described the whole experience to him, and he listened carefully. He then asked me to lie on my stomach on the exam table and to bend both legs at the knees. He squeezed both my calves and then palpated (probed) my bad leg extensively around the tendon. He left without comment and said the Doctor would be in to see me in a minute. Shortly after this, he and my main Doctor returned and she repeated the process. They briefly discussed whether they could do an ultrasound on the spot (It was 4:45 pm, by now), but ended up deciding to schedule an MRI. They told me I’d probably have to wait until the next day, because it was too late to get in on the same day. The doctor said she’d call me when she had a chance to view the results. I ended up getting scheduled for a mid-day MRI the next day. This was my first MRI, and it was quite an interesting experience. I highly recommend bringing your own earplugs - I brought mine but stupidly didn’t put them in before the procedure. They did provide a sound-reducing headset, but I would have liked some additional sound deadening. The hardest part of the process was trying to stay still during the scans. The longest scan was around 8 minutes, but most were between 4-6 minutes for a total of around 45-50 minutes of scanning. I asked for a copy of the MRI on the way out, and they were able to give me a CD within 5 minutes. I took the CD home, and as a pleasant surprise, saw that the images came with some viewing software that I could run. After another 24 hours of impatient waiting, my Doctor called me. She told me that it was a rerupture - she said she couldn’t understand how/why this would happen. They had used the strongest sutures you could use, and nothing like this had happened before. She had a few reruptures, but they were caused by accidents (one individual tripped over a toy once out of the boot, and caught himself with his bad leg). I told her I’d seen the MRI and it looked to me that the tear was actually slightly above the repair. She mentioned that there’s often a lot of scar tissue post-surgery and that it can be hard to figure out exactly what’s where. In any case, she said they’d prioritize me for surgery next Thursday (this was yesterday afternoon as I’m writing this, so the surgery will be on 2/28) and that her surgical assistant would call to arrange the details. After that we said our quick good-byes and hung up the phone. Two minutes later, she called back. She said she had taken another look at the MRI and that I was right - the tear does appear to be above the site of the original surgery and she *really* couldn’t explain what had happened. She said they’d be able to tell more when they opened me up, but this was very unusual. I asked if she would still recommend surgery, and she said yes, with the size of the gap that she saw. In any case, I’m finally caught up with my blog - the rest will be posted near real-time. It’s a bit of a bummer - I’ve now lost four weeks and bought myself a possibly more complicated recovery. I don’t regret choosing surgery as my path, and would almost certainly do so again, but there’s no doubt that this incident would probably not have happened had I opted for non-surgical treatment. It’s also a start reminder that regardless what the statistics are, ultimately as an individual your chances for a complication are either 100% or 0% - so be it. Sorry to hear the news. Your case doesn’t sound like it’s an usual occurrence, but keep your head up. I would rather something like this happen on Week 3 than Week 12 which is when you hear of most of these happening (when people are FWB and moving into 2-shoes). Hopefully, the surgeon will get in there and create a stronger repair, which in the end will heal better. Good luck. Ya, good luck, Ulrich, sorry about the bummer. And continue being your own “patient advocate”, and a continually better informed and “pushier” advocate, too. It does seem superficially unlikely that a recently repaired AT, overstressed, would tear in a brand-new spot removed from the repair. OTOH, the 3 totally inconsistent UltraSound exams of my more recent ATR (done at 1-week intervals to guide injections of PRP) included one that seemed to show multiple partial ATRs. While most overstressed ATs will rupture in one place, the whole tendon is usually loaded to the breaking point at the time of the rupture, so it’s not obviously nuts to expect that some parts that didn’t separate were weakened, too. I think one or two of this site’s “re-rupture” patients actually experienced a second rupture on the same AT, relatively early post-op or post-non-op. Did you notice at the painful and eventful boot-fitting that the boot’s ankle-angle was significantly less plantar-flexed than you’d had for 13 days in the cast/splint? Those angles should be virtually identical, IMHO. The reason your footwear is changing at about 2 weeks post-op is only because your incision is expected to seep and ooze for the first week or so, so an absorbent and disposible plaster cast (often surrounding some absorbent and disposible gauze) is handier than a boot you’re going to be wearing until ~8 weeks post-op. Several others here, during “my time”, have experienced difficulty accommodating to ankle-angle changes during rehab, though I can’t recall another rerupture from it. Ulrich, I’m so sorry to hear your news. Can I ask what may be a silly question? I’m just over a week in an aircast after two weeks in plaster post op. Could you walk on your boot after if was fitted? I spend most of my time in fear that I am about to or have re-ruptured. I’m super careful on my crutches but have started to experience calf pain and soreness around the wound in the past few days and I worry that I have overdone it and had a mini-rupture. I am PWB and can still put weight on and walk on my foot with crutches. Norm - As always, thanks for your words of wisdom. To answer your questions: Yes, I believe the angle of the cast was quite relaxed - I had a splint made for sleeping before they placed me in a boot, and that was already a bit painful. The boot seemed like it was really tight. In terms of the modality of the (re)-injury: I was thinking that in general if you stress a system to a breaking point, the weakest part lets go. That should kind of act like an electrical fuse does to protect the rest of the components. The other thought is that the rebound at the point of “snapping” may introduce all kinds of weird stresses that might be able to cause damage. My research seems to indicate that several people have had calf strains at the same time as an Achilles rupture, so my “fuse” theory might not be correct. I’ll see if my surgeon has any possible explanations, though I’m unfortunately now in a category of unusual cases that will probably make it much more difficult to find good information. Joya - My surgeon is fairly conservative about the recovery protocol. I’m supposed to be completely non weight bearing for the first six weeks (they’ll be adjusting the angle, but I’m not supposed to put any weight on the leg until I’m at 90 degrees). Having said that, since the reinjury, I’ve experimented putting light weight on my bad leg, and I can do so with no discomfort. From what I’ve read however, (and I’m sure Norm will corroborate this), it is quite usual for a more aggressive protocol to have you partially weight bearing as soon as two weeks. While in the boot, your foot is so well supported that the tendon is very well protected. Your instructions sound very consistent with what I’ve read elsewhere. My advice is to follow your doctor’s protocol. Be willing to ask for the reasoning behind the protocol, and if you’d like to change something about it, discuss it with your doctor, but ultimately you should go with what the doctor says. (If you find that the doctor is not giving you advice you like, then find another doctor rather than just modifying your protocol yourself). Ulrich, in a system that’s engineered with an intentional “weak link” — like an electrical system’s fuse/breaker or an outboard motor’s shear pin etc. — that link is significantly weaker than the SECOND-weakest part of the system. The weak link is also, by design, cheap and quick and easy to replace. Alas (or maybe not), our ATs are not designed that way. Instead (like every tendon in our bodies), they’re designed to be much stronger than the muscles (calf) that pull on them. Unfortunately, that system occasionally fails, which is why we’re all here. And fixing it is slow and frustrating, which is why we all have so many questions, details, and answers! In a system like an AT that’s designed not to fail by over-stress but does anyway, it’s anybody’s guess whether the “second-weakest link” is strong enough to survive the rupture without damage, or not. A related question that most of us have puzzled over, is just how strong our ATs were a day, an hour, or a second BEFORE our ATRs. A minority of ATR patients have AT problems before the ATR, and many of those folks blame themselves for continuing to run or jump or whatever. For the rest of us, the ATR came “out of the blue”, but that obviously doesn’t mean that our AT was perfect just before it tore. Given that uncertainty about the “weakest link”, why should we have any more certainty about your second-weakest link? Maybe it looked fine to your surgeon but was really very close to failure? Maybe it got (subtly?) damaged in the op, as the surrounding paratenon was stripped away from the tendon? Like so many things in medicine, it’s easier to find a treatment (or two) with a good chance of success, than to answer all the How, What, & Why questions. And that’s better than the other way around! @Joya: You should be able to examine your foot to see what the incision/scar looks like, etc. And you may also be able to adjust your AirCast’s straps and padding, etc., to make your leg more comfortable. Some incisions get inflamed or infected or don’t heal well, etc., etc. If yours looks OK but still hurts, I’d do two things: (1) take it easier with the PWB and (2) phone your Doc and maybe get an exam sooner than planned. @Joya & @UlrichW: As RyanB outlined on a GRAPH somewhere on his blog, even comparably aggressive protocols can be quite different in their timing of specific milestones, including the move to PWB and FWB. UWO goes to PWB at 2 weeks and FWB at 4 weeks, which is pretty quick, but waits for 6 weeks to change the ankle (plantar-flex) angle, which is on the slow side. Ryan’s Doc’s approach went the other way around. I doubt that his approach is as well tested and proven as UWO, but it may be just as good or better, and seems to have worked fine for Ryan. I deleted the post/question it was created for when cleaning up my blog a while back. My question was basically: which path should we take. My doc didn’t give me much guidance- I was just told to wean off the boot as I was able. The path I took was just based on recovery from other injuries- I’ve always worked on range of motion first, strength second. So, I worked to get all the way flat in the boot before trying to increase the load to FWB. It was only after the fact that I realized that - for this injury - that’s kind of an unusual approach. In case it’s not obvious: I followed the “green path”, while a lot of protocols like UWO seem closer to the “red path”. @ryanb & @normofthenorth, thank you this is really helpful. I am just panicking as I’ve had a few days of pain and discomfort and put this down to a re-rupture (even though I haven’t don’t anything that would cause it). My leg has settled down again now and I can PWB with no pain. I’m not concerned with my treatment so far, I just don’t like the unknown! Thank you again and @ulrichw sorry for hi-jacking your comment feed! Joy- if putting pressure on it hurts, it’s probably not re-ruptured. A re-ruptured (severed) Achilles is incapable of carrying load - or transferring stress/force into the joint. For the ~36hours between my injury and surgery, the Achilles area was remarkably pain free. I could hobble around on it without causing too much discomfort. It was just totally unstable and weak. Mind you, the recoiled calf muscle was VERY sore… but the Achilles itself: just a non-responsive, lifeless puddle of mush. There was nothing pulling on it; nothing to pull against. I can walk with crutches pain free. My calf has ached a little but I put this down to cramps. It doesn’t feel weak or unstable when I am crutching around. Most of my recovery post op has been pain free, so I am lucky in that sense. @ulrichw, @normofthenorth and @ryanb, just wanted to let you know I say my surgeon today. He is really pleased with my recovery. No tears or re-ruptures. Thank you so much for your advice earlier in the week. I was rather ‘on the ledge’ about things and worried, so thank you. Joy - really glad that everything is going well for you; It’s easy to get worried about how things are progressing, especially because every case tends to be a little different. One thing that I took away from reading many of the blogs on this site, is that pretty much everyone eventually recovers - so no matter if there are a few setbacks, we’ll still make it there eventually. Trifecta Health and Psychiatrist Dr. Fruitman offers Adult ADHD, Depression, Anxiety, Substance Abuse, Weight Management and Transcranial Magnetic Stimulation (TMS) for depression in New York City. Hey - thanks for the advice, Norm! I like the idea of the night-time change and agree with you on the danger of the gap - To be honest, I don’t understand how they came up with 10 degrees as the increment of change - it seems like quite a substantial switch each time. If they would provide just one 5 degree shim in addition to the 10 degree shims, it would let you make 5 degree adjustments, which seem much more easily doable. 1) ELEVATE! Control that swelling! 2) my fave way to change ankle angle is with the boot, at bed-time, and “sleep on it”. That way you can separate the “stretch” from the “load”. Even when you’re NWB, it’s dangerous to go around with a gap below your heel, because a small slip could close that gap and send you back to the OR. And when you’re PWB or FWB, making the stretch and load together feels obviously scary, and probably is. So sorry to hear the trauma you have been though. I look forward to hearing your updated report after the next visit. Hopefully, the reaction is to something temporary (drugs, or something else (possibly latex?)) that you were exposed to during your surgery. In rare cases, some can even be alergeic to the internal sutures, which is a real bummer. My wife had surgery for a broken tib/fib - including metal plates and screws. She had an allergic reaction to the (probably the alloy nickel content) hardware. It all had to come out as soon as the bones had started to fuse- 2nd surgery, and longer recovery. The original intent was to leave the hardware in there permanently. If you escape from a cast WITHOUT going a bit bonkers from itchiness, you may be the FIRST! I’d love to get a reference to the evidence that shows better healing with a cast than a boot. The best-results studies I keep citing AND the good-results “early mobility” post-op studies that are on this site’s “studies and protocols” page, all did as well or better with boots. Mind you, most studies (and OSs) put post-op patients in something absorbent (splint or plaster cast) for the first 2 weeks, but that’s mostly so they don’t mess up the boot (and they’d probably have to wrap the incision area with gauze and stuff anyway). One guy here recently broke out in hives/rash on the trip home from surgery, after eating 2 jalapeno chips. He thought it was a reaction to the anaesthetic, IIRC. Thanks for the words of support, guys - I have managed to schedule an appointment to have the splint looked at tomorrow. I also had an appointment with another doctor today to get a second opinion - I’ll write up that experience together with whatever happens at tomorrows splint appointment. The good news is I’ve weaned myself off the pain meds again - the discomfort is manageable even without chemical assistance. Sorry to hear about that. I experience some severe pain the first 3 days (from the extreme swelling), but was able to manage it with double doses of Loratab. After the first 5 days I was able to half the does, and by week 3 I was only taking it to sleep at night. 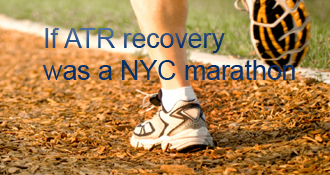 Anyway, the first part of recovery is all about rest, elevation, and pain management. Good luck. You’ve been through a lot, and post-op experiences vary a lot, even when it’s the same patient (and leg)! But I’d fight to get that cast or splint redone so your position is closer to “gravity equinus”, which is a typical (and natural = relatively painless) post-op recovery position. Also, the sooner you get into a boot (a well-fitting and well-adjusted one this time! ), the sooner you can make your own tweaks and padding and such to eliminate pains. Yeah - the pump is pretty much 0 for 2 for me so far. I’m guessing that it may be very position-dependent - i.e., if it’s not in exactly the right place, it doesn’t work well. The nerve-block pump sounds really clever and elegant (if bulky) — too bad it doesn’t work well. Good luck — this time’s a charm!! A related question that most of us have puzzled over, is just how strong our ATs were a day, an hour, or a second BEFORE our ATRs. A minority of ATR patients have AT problems before the ATR, and many of those folks blame themselves for continuing to run or jump or whatever. These views are actually from prior to my surgery (I had just already posted the other posts before figuring out how to get the pictures embedded). If you install the ATR Timeline Widget, you won’t have to remind us of which week it is all the time. I put a padded stool in front of the bathroom sink and kneeled (knelt?) on it while brushing teeth. Why can’t I see any trace of a big ugly healing incision in your photo? Heh - yeah I could see why that might be difficult, and I would imagine it’s not very good news if for some reason you *are* able to elevate the chest significantly above your heart. To my surprise, my post-op pain after open-heart surgery was WAY less than after my ATR surgery. After the heart op, I turned down all the narcotics and stopped the Tylenol after maybe 2 days. Not being a martyr, either! Not easy to raise your chest way above your heart, either! You are exactly right. I would of skipped the 4.5 months between injury and treatment, which obviously affected my recovery negatively. Had I heeded “that” advice and found out about Achillesblog (That happened about 2-3 weeks before my surgery)! Keep us posted. Yeah - people keep saying it, but I don’t think you can say it too much: Take charge of your treatment. Be educated, ask questions, and don’t just go along with everything the doctors recommend. Like you, I like to stay “in touch” with pain, and avoid pain meds I don’t need. And I find I can withstand a lot as long as I know the cause, and that it’s for my benefit and/or I’m in control of it. Others advise “staying ahead of the pain”, having experienced that it’s easier to keep it away than to make it go away after it makes an appearance. Chacun a son gout. I’ve also managed to escape post-GA nausea whenever I’ve been surgically knocked out. Yes, X-rays of apparent ATRs are a total waste of time maybe 99% of the time. Unfortunately, in the remaining ~1%, the over-stressed tendon has broken off a piece of the heel (calcaneus?) bone at the attachment point. Especially for patients slated for non-op treatment, that complication is important. Whether or not that justifies subjecting all ATR patients to X-rays or not is probably an arguable point. And the opinion that partial ATRs respond better to non-op treatment than full ATRs is common, mostly because it has a smidge of logic to it. But in this area of medicine, most of the good evidence we’ve gotten seems to DISprove logical-sounding theories. . . Thanks for your comments, Norm - I have great respect for all of your contributions to this site! Certainly I made a pretty significant “intuitive” leap re: surgical complications and my risk of acquiring them. Still, for me the main criterion was the outcome with respect to the tendon itself, and if I had to go through some extra pain on the way there - so be it. I also have a slightly different interpretation of the podiatrist’s “advice” to get an MRI. This particular sports medicine clinic has their own MRI facility, and I think he was using this justification more to convince me to give them the extra revenue from the MRI than that he had any real expectation that surgery would not be required. They actually asked me to take an X-ray before he saw me, but after I asked them whether it was necessary, they quickly backed off. True, I can recall only one test in one study — one of the strength tests in the 2007 New Zealand study, IIRC — where the non-op patients actually demonstrated a result that was statistically-significantly BETTER than the post-op patients. In that study, all the other tests were statistically “not different”. And I think the 2010 UWO study went exactly the other way — all tests statistically “not different” except one, where the post-op patients were statistically-significantly stronger. And a simple review of UWO’s raw results suggests that the statistically “not different” results mostly showed a bias in favor of the post-op crowd. I wish I could confirm your conclusion that infections and non-closing wounds and ill-tempered non-dissolving sutures avoid healthy and fit patients, but I’m not convinced it’s so. At the extremes, many diabetic patients and some other sickly folks do have troubles with wound closures, but many infections seem to be “equal opportunity” nasties. That PCP sounds like a total jerk. (Remember that half of all med students graduated in the bottom half of their class!) Initial swelling and pain are both hugely variable, “all over the block”, in ATRs. NOT the sort of thing anybody should rely on for diagnosis!! And especially when a Thompson test (and palpating for a gap) take maybe 5 minutes tops. ulrichw’s AchillesBlog is proudly powered by WordPress and WPDesigner..